A popular vacation destination in the central part of Florida, Kissimmee's major claim to fame remains its sunny weather and proximity to a large Disney entertainment complex. Take a break from the city and head to Cocoa Beach and Fishing Charters & Tours. 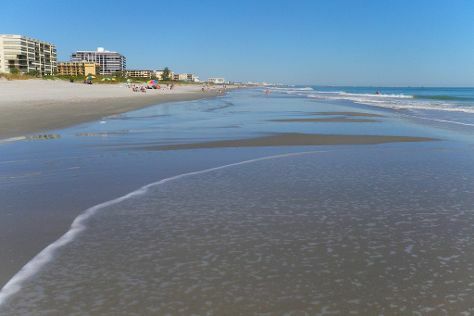 Change things up with these side-trips from Kissimmee: Kayaking & Canoeing (in Weeki Wachee), Manatee Sanctuary Park (in Cape Canaveral) and Cocoa Beach (Cocoa Beach Pier & Ron Jon Surf Shop). Pack the 7th (Wed) with family-friendly diversions at Busch Gardens. Plan for a day of cool, family-friendly fun on the 8th (Thu) at Legoland Florida Resort. There's still lots to do: take a stroll through Old Town, enjoy some diversion at Machine Gun America, examine the collection at Robert W. Willaford Railroad Museum, and admire nature's wide array of creatures at The Florida Aquarium. For other places to visit, traveler tips, ratings, and more tourist information, refer to the Kissimmee journey planning website . If you are flying in from United Kingdom, the closest major airports are Orlando International Airport, Orlando Sanford International Airport and Daytona Beach International Airport. In August, daily temperatures in Kissimmee can reach 38°C, while at night they dip to 28°C. Finish up your sightseeing early on the 10th (Sat) so you can travel back home.